We then walked around Williamsburg and checked out a bunch of their cool boutiques. At this point, we were going to suggest doing a Brooklyn Pizza Tour, but since we were still stuffed from brunch, we opted to take pictures by the Brooklyn Bridge instead. It was so cold, that we headed to Jacques Torres Chocolate to warm ourselves up with some hot cocoa. 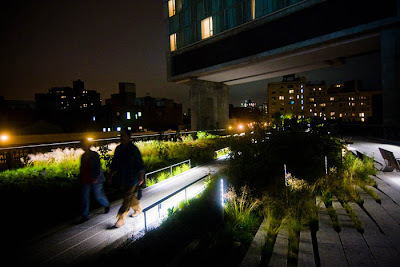 We went back into the city and walked around the High Line Park in the Meatpacking District. The High Line was originally constructed in the 1930s, to lift dangerous freight trains off Manhattan's streets. Now, it's been redone as a public park with beautiful wildflowers. Since we were in this part of the city, for dinner that night we went to Scarpetta. What's better than a hearty pasta dinner on a Sunday night? This restaurant is beautiful and the food is really good. I would say it's a nice date place or a great restaurant to go to with friends. Their most popular dish is their Spaghetti with tomato and basil. What a great day both in Brooklyn and the city!